The Hungarian Vizsla is one of the oldest pointer/retrievers in existence. It is believed that the ancestors of today’s Vizsla came with the Magyar nomads who crossed the Carpathian Mountains into what is now known as Hungary in approximately 985 AD. Historically, they were possessions of the landed aristocracy. This all changed with the first World War when the social order in Hungary was drastically changed. With World War II and the Russian occupation, the Vizsla was nearly lost. Dedicated lovers of the breed spirited their dogs out of the country to save it. The dogs began arriving in the United States in the early 1950’s. 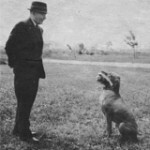 In 1960, the breed was recognized by the American Kennel Club. The Vizsla Breed Standard calls for a medium sized dog. Males stand 22′ to 24′ tall, and females range from 21′ to 23′. The average weight is 40 to 65 pounds, depending upon height and amount of bone. The short, slick coat is varying shades of golden rust. The eyes, nails and nose should blend with the coat color. A small amount of white is allowed on the chest, but is not desirable. Massive areas of white on the chest, or white extending over the toes is a disqualification. 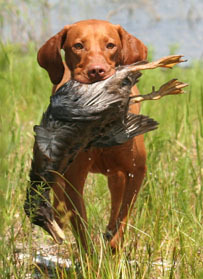 The Vizsla is used as a gun dog that can point and retrieve either fur or feather, but in the United States hunts mostly upland birds. 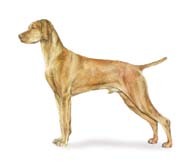 The Vizsla is a very versatile dog; you will also find him in the show ring, obedience ring, the field, in agility, in tracking, and working as therapy dogs. 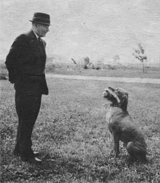 The first AKC Triple Champion was a Vizsla. 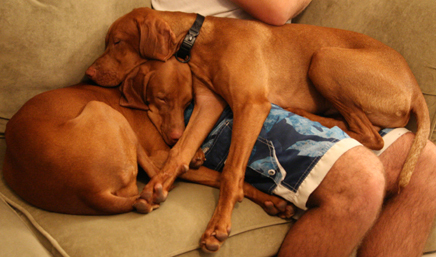 Vizslas are often called “velcro” dogs because of their desire to be with and near (and on top of!) their owners. The AKC standard calls them “demonstratively affectionate.” They like to be touching people at all times. 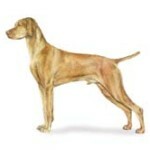 Vizslas also have a lot of energy and stamina, they were bred to hunt all day long. They make excellent jogging partners once they are done growing, but do not expect a walk, even a long one, or several, to be enough exercise for a young vizsla. Getting enough exercise for a young vizsla is essential and not an easy task for inactive people or people who are too busy to devote time every day to this endeavor. The importance of their need for exercise in order to be “good dogs” in the home cannot be stressed enough. The most common reason that vizslas are turned into rescue is because they have too much energy or need more attention than the owner can give. Vizslas are loyal, friendly, affectionate, outgoing, fun-loving, athletic dogs that can make an absolutely wonderful pet for the right owner. 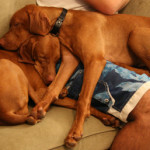 Is the Vizsla the right dog for you? Click some of the links below to find out more about this breed.